La Casa de Contratación (The House of Trade) was a government agency under the Spanish Empire from the 16th to the 18th centuries, which attempted to control all Spanish exploration and colonization. Its official name was La Casa y Audiencia de Indias. Unlike the later East India Companies, chartered companies established by the Dutch, English, and others, the Casa collected all colonial taxes and duties, approved all voyages of exploration and trade, maintained secret information on trade routes and new discoveries, licensed captains, and administered commercial law. In theory, no Spaniard could sail anywhere without the approval of the Casa. However, smuggling often took place in different parts of the vast Spanish Empire. The Casa was founded by Queen Isabella of Castile in 1503, just eleven years after the discovery of the Americas in 1492. The Casa was the Spanish counterpart of the Portuguese organization, the Casa da Índia, or House of Índia of Lisbon (est. 1400s, destroyed 1755). A 20% tax (the quinto) was levied by the Casa on all goods entering Spain, but other taxes could run as high as 40% in order to provide naval protection for the trading ships or as low as 10% during financial turmoil to encourage investment and economic growth in the colonies. Each ship was required to provide a clerk who kept detailed logs of all goods carried and transactions. . The Casa de Contratación produced and managed the Padrón Real, the official and secret Spanish map used as template for the maps present in all Spanish ships during the 1500s. It was constantly improved from its first version in 1508, and it was the counterpart of the Portuguese map, the Padrão Real. The Casa de Contratación also ran a navigation school. New pilots, or navigators, were trained for ocean voyages at this school. 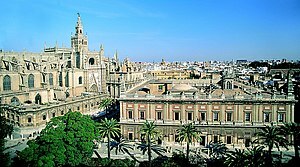 Spain employed the then standard mercantilist model, governed (at least in theory) by the Casa in Seville . Trade with the overseas possessions was handled by a merchants' guild based in Seville, the Consulado de mercaderes, which worked in conjunction with the Casa de Contratación. Trade was physically controlled in well-regulated trade fleets, the famous Flota de Indias and Manila galleon. By the late 17th century, the Casa de Contratación had fallen into bureaucratic gridlock, and the Empire as a whole was failing, due primarily to Spain's inability to finance both war on the Continent, and a global empire. More often than not, the riches transported from Manila and Acapulco to Spain were officially signed over to Spain's creditors before the Manila galleon even made port. In the 18th century, under the new Bourbon kings, the power that Seville and the Casa de Contratacion once had would be reduced. The Casa de Contratación was moved from Seville to Cádiz in 1717. Under Charles III its powers were greatly reduced, and it was finally abolished in 1790 under his son, Charles IV. The mapmaking enterprise at Casa de Contratación was a huge undertaking, and it was taken very seriously. Without good navigational aids, the ability of Spain to exploit and profit from its discoveries would have been limited. The Casa de Contratación had a large number of cartographers and navigators (pilots), archivists, record keepers, administrators and others involved producing and managing the Padrón Real. The famous Amerigo Vespucci, who made at least two voyages to the New World, was a pilot working at the Casa de Contratación until his death in 1512. A special position was created for Vespucci, the "pilot major" (chief of navigation) in 1508. He had the responsibility of training new pilots for ocean voyages. His nephew Juan Vespucci inherited his famous uncle's maps, charts, and nautical instruments, and was appointed to Amerigo's former position as official Spanish government pilot at Seville. In 1524, Juan Vespucci was appointed Examiner of Pilots, replacing Sebastian Cabot who was then leading an expedition in Brazil. In the 1530s and 1540s, the principal mapmakers (known as "cosmographers") in the Casa de Contratación working on the Padrón Real included Alonso de Santa Cruz, Sebastian Cabot, and Pedro de Medina. Mapmaker Diego Gutierrez was named cosmographer in the Casa de la Contratación by royal appointment on October 22, 1554, after the death of his father Diego in January 1554, and worked on the Padrón Real. In 1562 Gutierrez published a remarkable map entitled "Americae ... Descriptio" in Antwerp. The reason it was published in Antwerp instead of Spain was that the Spanish engravers did not have the necessary skill to print such a complicated document. Other cosmographers included Alonso de Chaves, Francisco Falero, Jerónimo de Chaves, Sancho Gutiérrez (Diego's brother). In the late 1500s, Juan Lopez de Velasco was cosmographer major in Seville. He produced a master map and twelve subsidiary maps portraying the worldwide Spanish Empire in cartographic form. This feat surpassed anything done by other European powers at that time. However, this signalled the end of Spain's supremacy in mapmaking, and after the work of Velasco, others such as the English, Dutch and French were better able to organize and present geographic information.